You are currently using Internet Explorer 8 which is not supported by our new website. We recommend you update to the latest version of Internet Explorer or alternatively use a different web browser. 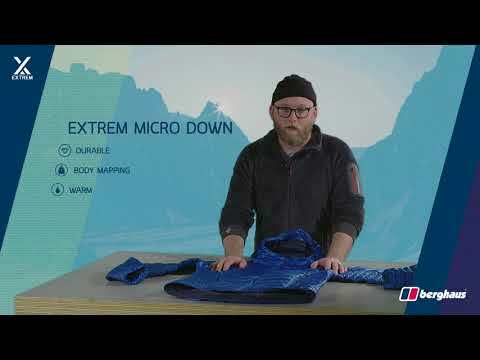 The Extrem Micro Down Jacket is a super-versatile and lightweight piece of cold-weather gear. Climb, ski and trek into the extreme, confident that you have super packable warmth available in an instant. This pro-level piece of gear is stuffed with our remarkable Hydrodown® insulation – which keeps on working when wet, unlike traditional down – while body-mapping technology means you get the heat where you need it most. And if – like us – you care about how products are made, you’ll be happy to know that this jacket is RDS-certified for guaranteed ethical sourcing of the down. WINDPROOF GUARANTEE - Highly windproof and incredibly light without sacrificing strength or durability, that’s the beauty of award winning Pertex® QUANTUM® Diamond Fuse. LONG LASTING WARMTH - Filled with our ethically sourced hydrophobic down, Hydrodown® powered by NikWax® – for long-lasting warmth that keeps on working for up to 16 hours when wet. INTELLIGENT HEAT DISTRIBUTION - We used innovative body-mapping techniques to ensure efficient distribution of heat, putting warmth where you need it. Super-versatile design, suitable for climb, ski or trek. FREE Express Delivery on all orders over £100. approx 4 - 5 working days. For 50 years, Berghaus has been committed to endless innovation and the relentless pursuit of excellence. We believe passionately that our products make a real difference to the people who use them – and we guarantee our gear will stand up to the task it’s intended for (yes, that does rule out using your jacket as a paragliding sail). Berghaus Ltd would like to keep you updated about our latest news and offers. If you are happy for us to do this, please enter your email above. See our Privacy Notice for more information on how we handle and use personal data including how to withdraw consent at any time. Copyright © 2019 Berghaus Limited. All rights reserved. All trademarks acknowledged.